The name Pickets Witch was originally applied to the triangular piece of land forming a very acute angle where Marsh Lane joins Ilchester Road. 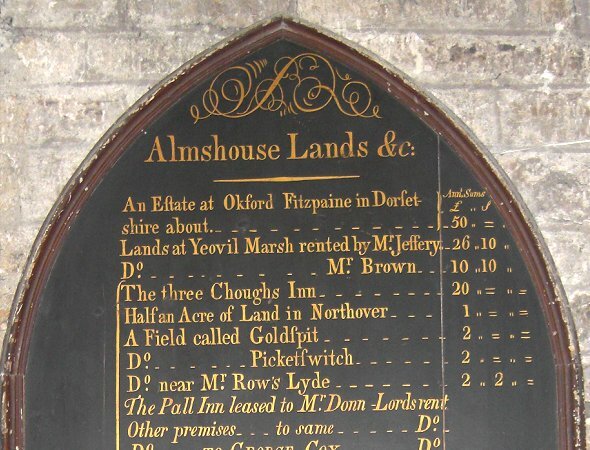 A charity board, dated 1804 and photographed below, mounted on the wall of the bell tower of St John's church indicates that Picketswitch was the property of Woborn Almshouse. The first element is Old English piccede meaning piked, pointed or an acute angle. The second element is also Old English wice meaning elm, particularly the wych elm. It was later (1846 Tithe Award) known as Piccadilly (Parcels 1403 and 1404). A deed from the time of Richard II (reigned 1377-1399) refers to 'Pycit Cross' and the name Pyked Weeche occurs in the Woborn Almshouse records in the 15th, 16th and 17th centuries in the phrase "in the West Field (of Kingston near Yeovil) near Pyked Weech". In describing the boundaries of the great Middle Field of Kingston Manor, it is referred to "from Marshweeche to Brimsmore Tree and from thence to Picked Weech being oxen Furlong and wide Gore". Originally part of the great Medieval West Field of Kingston Manor, the field later known as Piccadilly was originally called Wide Gore in the 1589 Terrier but by 1743 the Terrier referred to 'Piccadilly, 5 acres' and 'Mines Piccadilly', 4acres, indicating that the field was formerly two fields later combined. Piccadilly was a fairly common nickname applied to places on the outskirts of towns and other remote areas. The name derived from London's Piccadilly, so-called from the name of the once-fashionable stiff kind of collar made by a Mr Higgins and referred to as 'pickadils'. His manufactory at that time was set in open countryside which became known as Piccadilly. The designation appears to have derived from the Old English piced meaning 'a pointed piece of land' as seen in its earlier name of Pickets Witch. The 1832 Poll Book noted that Benjamin Watts of Green Quarry owned lands at Piccadilly while the 1842 Tithe Map and the 1846 Tithe Apportionment refer to Parcels 1403 and 1404 as 'Piccadilly and Plantation', being 8a 0r 30p and used as pasture. Both parcels were recorded as being owned by John Glyde with William Harrison as tenant. Piccadilly (1403) was a triangular shaped field bounded on the east by Marsh Lane, on the southwest by Ilchester Road, to the north by Arnold's Close (1402) and on the eastern corner by Lower Oxen Furlong (1405). 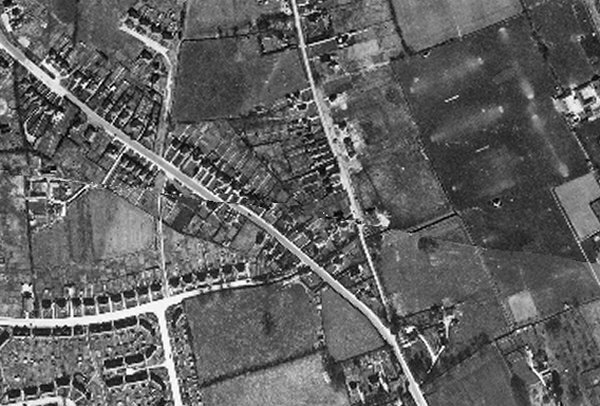 Piccadilly was completely filled with houses and gardens of Marsh Lane and Ilchester Road by the time of the 1946 aerial photograph below. 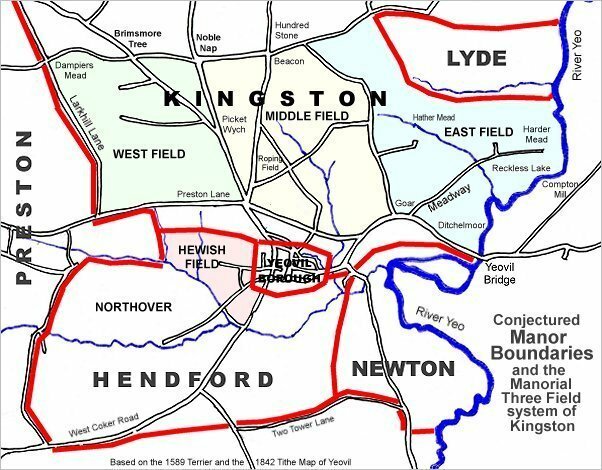 This map, based on the descriptions in the 1589 Terrier and the 1846 Tithe Map of Yeovil shows the approximate boundaries of the Manors of Kingston and Hendford as well as the manorial three-field system used in Kingston. The Hollands area reproduced from the 1842 Tithe Map. Piccadilly is at centre.. The 1946 aerial photograph showing Piccadilly at centre, filled with housing at this time. Ilchester Road runs diagonally across the left of the photograph and Marsh Lane runs up the centre. 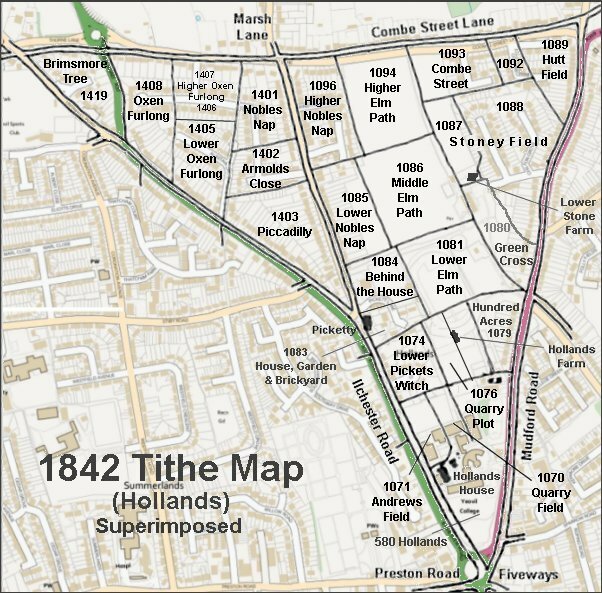 The 1842 Tithe Map superimposed over a modern map. One of the four Charity Boards on the wall of St John's bell tower. Listing all the lands the Woborn Almshouse owned in 1804. Picketswitch was valued at £2 per annum (around £1,800 at today's value).